Discount Cards are the most popular product that we offer. Discount Cards are laminated and made of quality, heavy plastic. With your input, we design a custom front and back that represents your group’s requests. Discount Cards typically have 16-22 merchant discounts from your local and surrounding communities. We acquire all the merchant discounts for you. Most discounts can be used once per day and 365 days per year. There is NO CHARGE for the businesses to be on the back of the card. The community gets a tangible product for their support of your group. They save money by using the discounts on the back of the card at businesses throughout the community. A supporter can typically get their money back after only a couple uses of the card. There is NO CHARGE to be on the card, it is FREE ADVERTISING! Local businesses can show their support for the local schools or organizations by offering a discount with some value. They receive increased traffic to their establishment as well as increased sales from the additional repeat business created from appearing on these cards. This also helps build and improve their “regular customer” base. 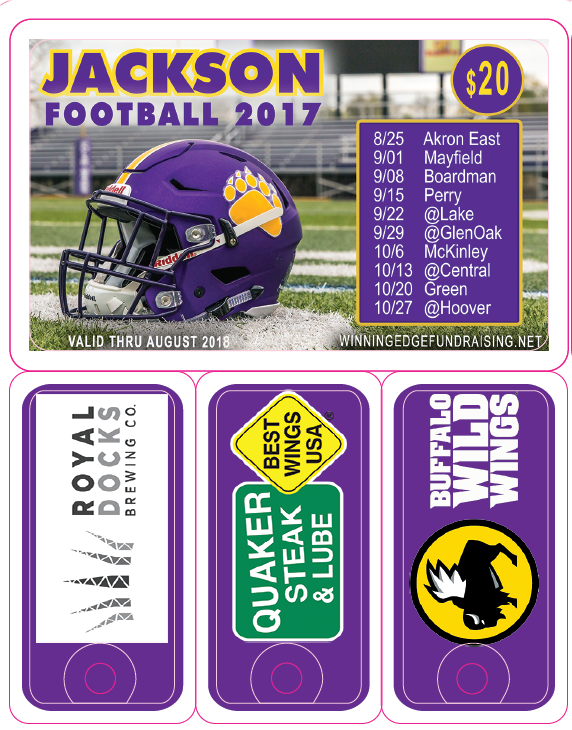 The team or organization raises much needed money for their program by selling the Discount Cards directly to the community. This money goes towards improving all areas of a program and allows for the group to operate at a high level and to achieve their goals. Bottom line: Your group earns thousands of dollars by helping your local merchants grow their businesses, and saving your community thousands of dollars – all at the same time!